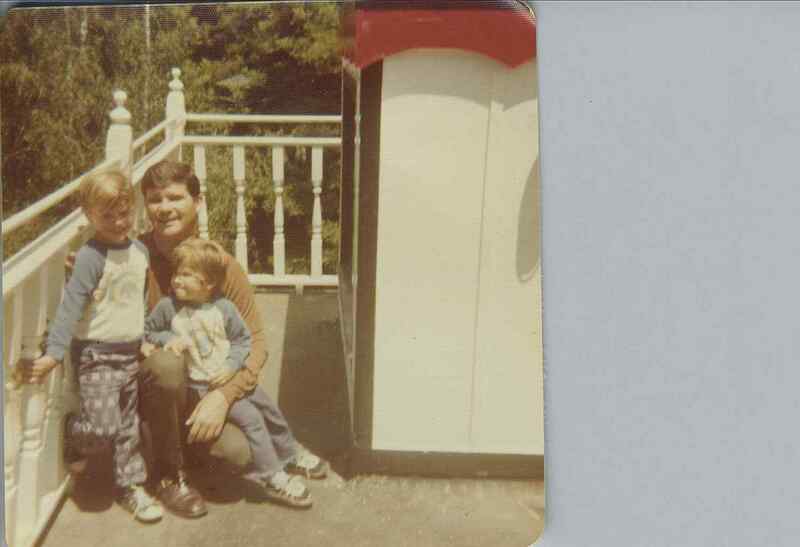 This is me(Mike) with my brother and dad at probably around age 3. I'm the smaller year younger brother. 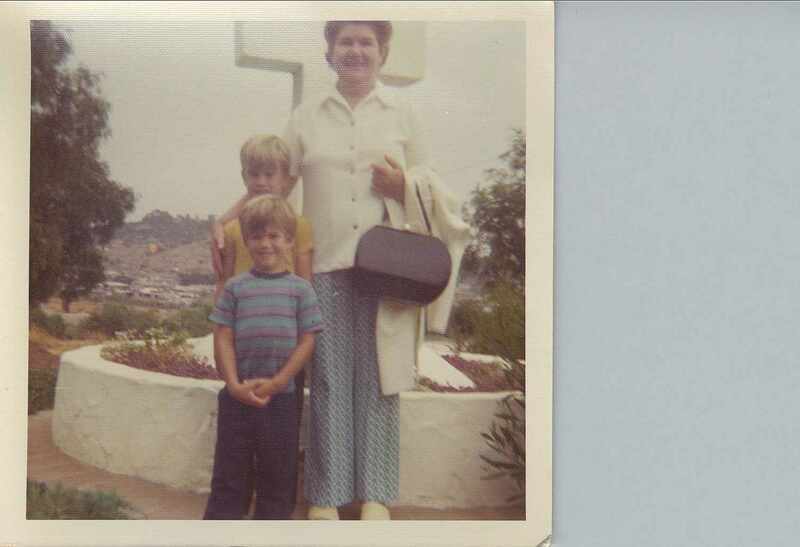 This one is Me and my brother and our paternal grandmother also around same ages, and this is just me and my dad same period of time. 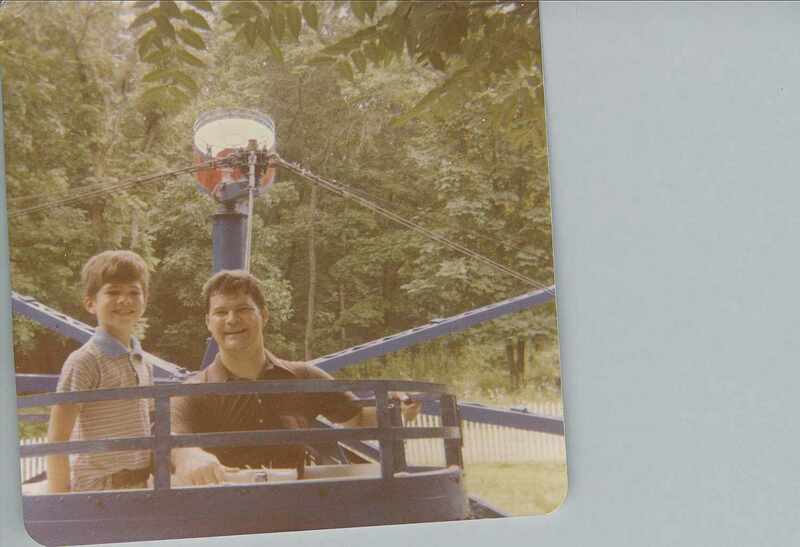 This is mike and dad again i'm a little older. 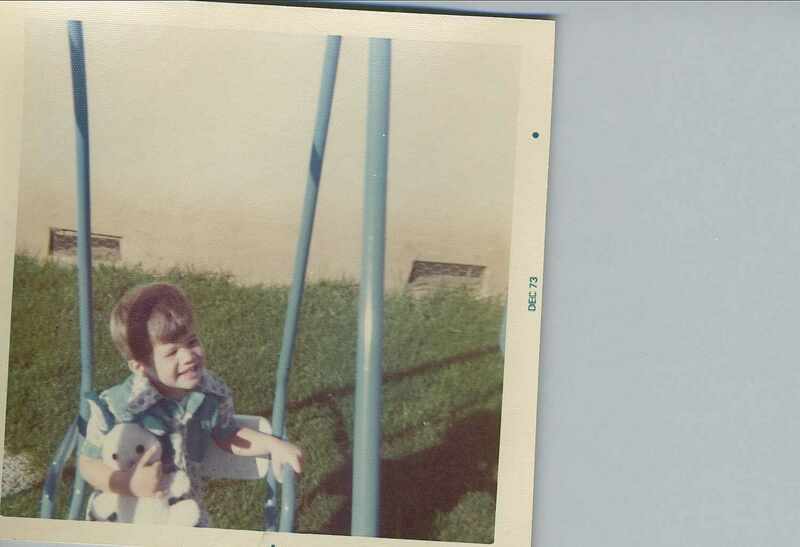 And this looks like Mike on a swing same period. 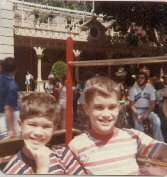 Hi, the above picture is me (Mike Adams) and my brother (Mark Adams) under the age of 5. 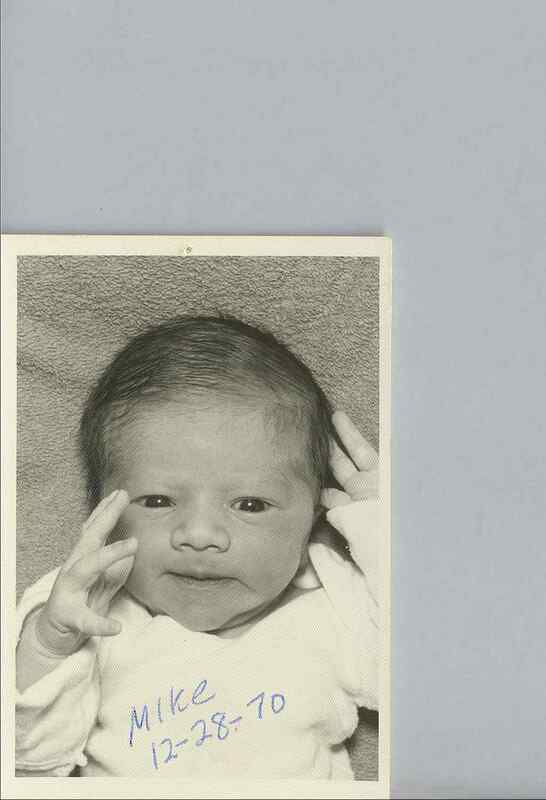 I'm a year younger brother with my chin in my hand. At this time i lived in the south bay area ( San Jose first then moved to Santa Clara ) in the early 70s were i would live tell I moved to Maryland in the middle of first grade in 1977. Before moving to Maryland, I attended Washington Elementary School in Santa Clara, CA. In Maryland i was one of the few kids who was not a long time local since most of the kids not only had lived in Frederick all their life but thier parents had as well. Below are some pictures of me growing up and some more recent ones dating to 2016. Click on the picture below to see me at about 9 or 10. I had got something stuck in my eye thats why the patch and it came off in a few days. At this time i lived In Frederick Maryland and attended Liberty elementary school. I went to 1st through 4th grade in Frederick before moving to San Diego in 1981. Me and my brother did soccer for one year while in Frederick. Liberty Elementry School was nearly a 100 years old and had been a high school in the past but when i attended in the late 70s parts of it were condemned. While living in Frederick our parents would often take us to malls in the area on weekends and me and my brother would play Pong a few times but the video game and computer revolution would not really hit us yet till we moved to San Diego next. While in Maryland in addition to malls our parents drove us around the area and I got to visit Washington DC quite a few times during those years where we would visit places like the Smithsonian museums and historical sites. Gettysburg, PA(a Civil War battle field site) was also a place we visited several times. And we got into Baltimore. They had built a nice science center by 80/81. My elementry school also took us on field trips each year to Baltimore or Washington DC. I would become an avid reader outside of school assignments in Maryland starting some time after christmas in first grade. This is me in 4th grade in Maryland around the same time as the eye patch picture. 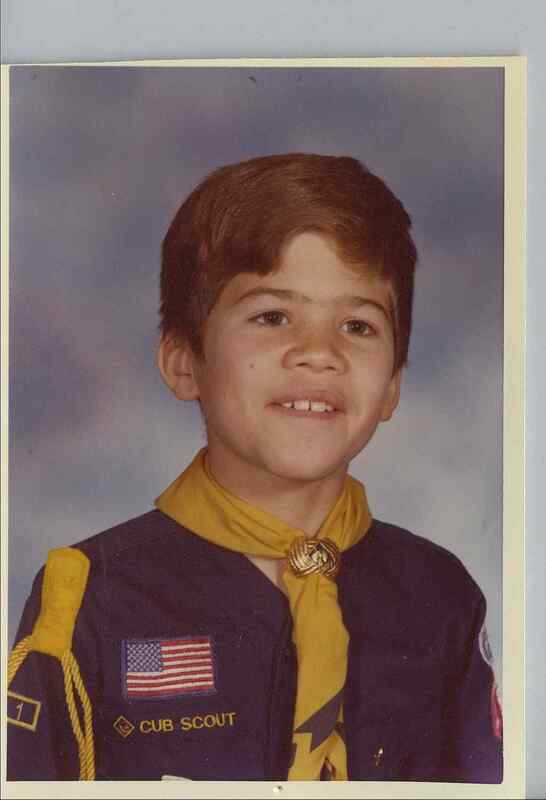 I was a cub scout that year. 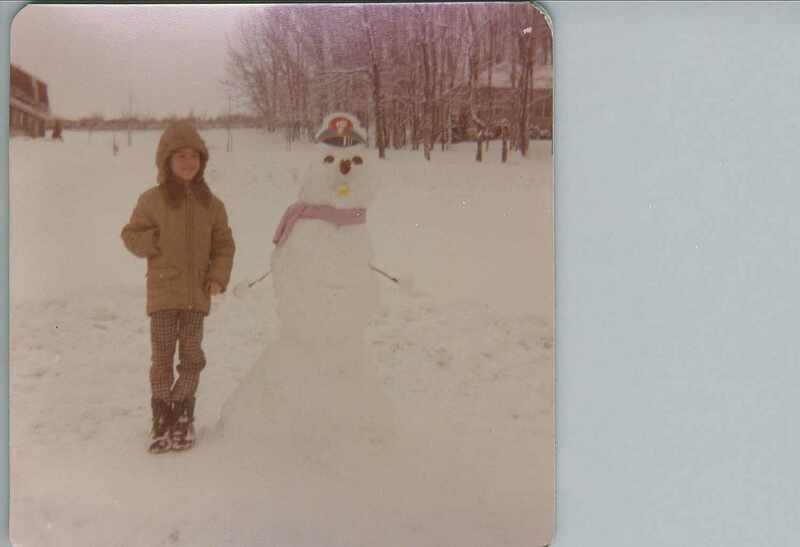 And this one shows me in the front yard in the snow in Maryland, maybe third grade and you can see we the woods across the street. 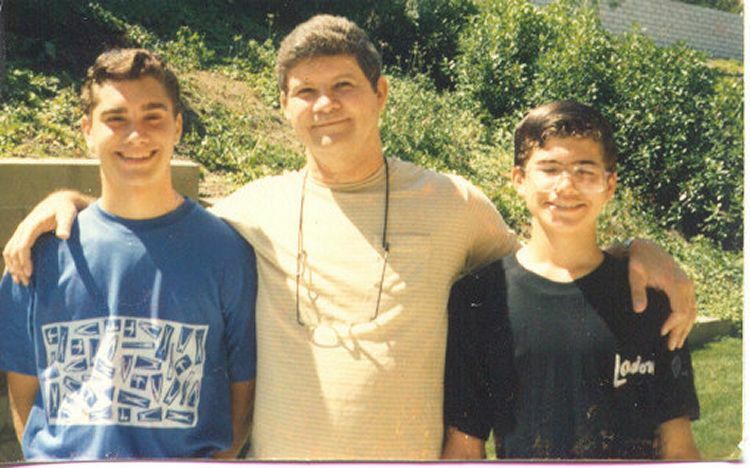 Below is me(Mike), Brother ( Mark ), Dad shot and i'm about 12. I was attending Black Mountain Middle School part of the Poway School District in San Diego (Rancho Peñasquitos). 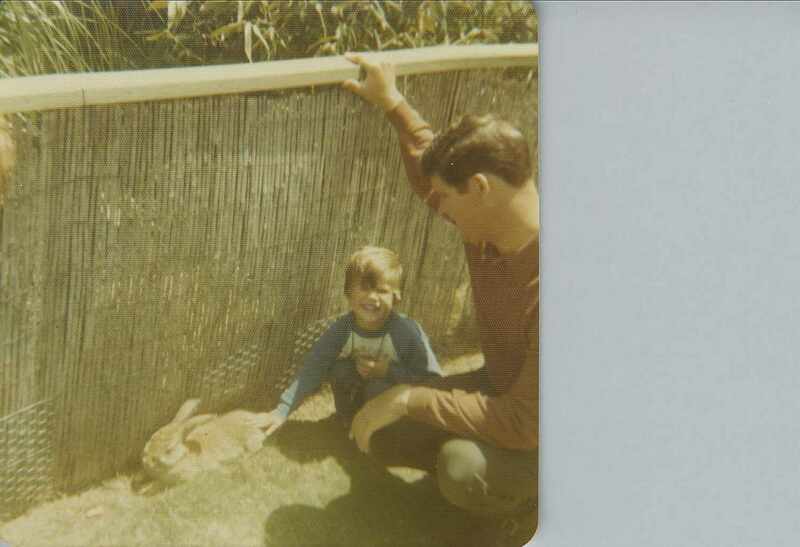 My dad's brother was very sick in 1981 and would pass away a couple of years later and living in San Diego had us close enough to my uncle, who lived in Apple Valley, CA, that we could do frequent day trips. This was probably 1983 and also the period that I first learned to program using the BASIC programming language first on a Vic-20 (a stripped down Commodore 64) then on an Atari 400 which was similar to the Atari 800 but had less memory and not as good a keyboard. It was also cheaper than the Atari 800 and I used a cassette drive to store my BASIC programs though disk drives existed but the cassette drive was cheaper. My parents were buying a system of course for me as a young kid. I had started out in San Diego at Sunset Elementary School in 5th grade. It was difficult of course to move to a new town ( San Diego ) and start a new school in the last grade (5th). I'm the little guy in this one with the striped shirt. click below to see full size one. Me in 6th grade also around same time as above picture. 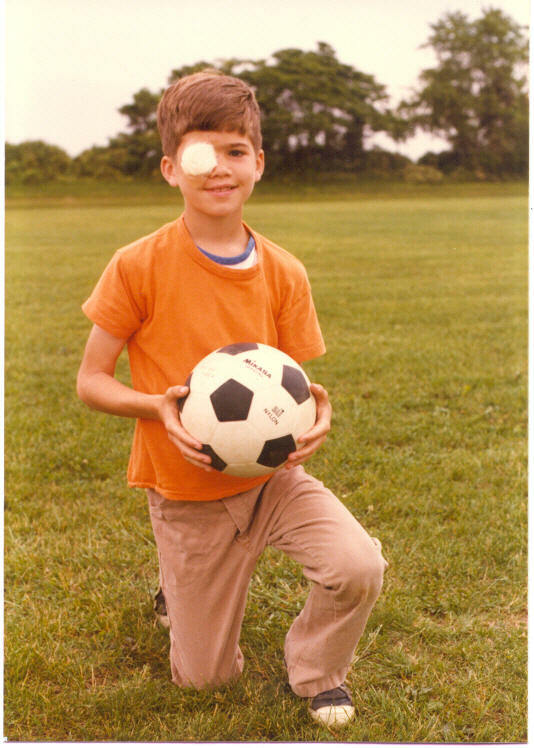 I had a habit of breaking my glasses playing team ball that year. For Christmas of 6th grade me and my brother got our first game system, an Atari 5200 and about 5 game cartridges which included Pac Man, Breakout, Missile Command and Galaxian. My favorite was Galaxian on the Atari. In 7th grade for Christmas of 1983 I recieved an Atari 400 for programming BASIC, a language I had allready started learning in school. In 7th grade I made the switch from reading childrens books to reading science fiction/fantasy books after my Dad introduced me to my first science fiction/fantasy author Piers Anthony, and I would continue to read from that genre till about tenth grade. I was also an avid Marvel Comics reader from about 5th grade to tenth grade with my favorite character being Spider Man. 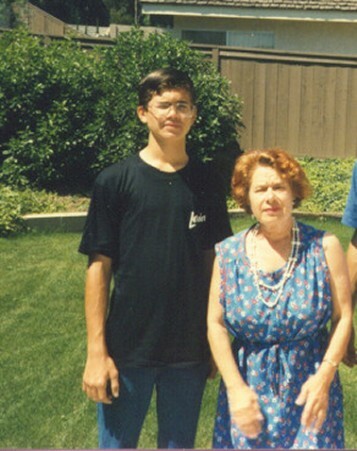 Below is me at age 14, in Dana Point, California, with my grandma. 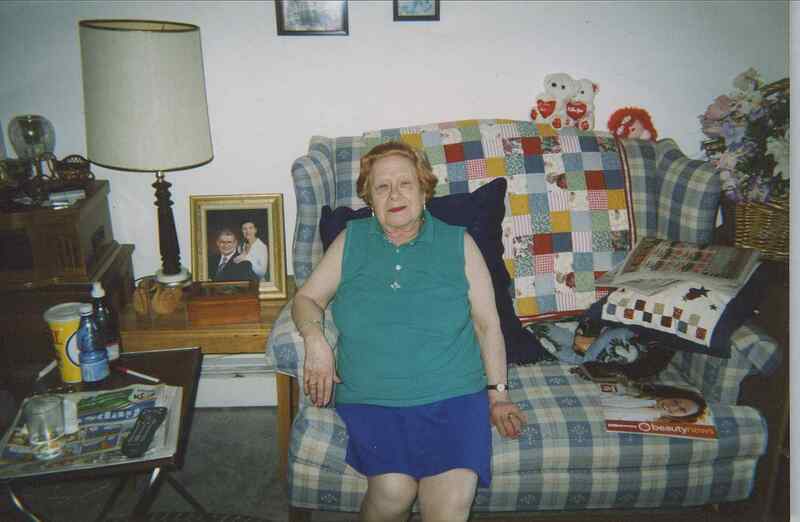 My grandma(mom's mom) got to seee this photo on my web page in the 2000's and sent her photo when she was 81. We moved to Dana Point after I finished 7th grade. I liked living in Dana Point and I could bike to the ocean in a few minutes from our house or in the other direction, San Juan Capistrano that had a little city center where me and my brother bought records typically of top 40 artists on the radio at the time. click on the picture below to see the full size picture. 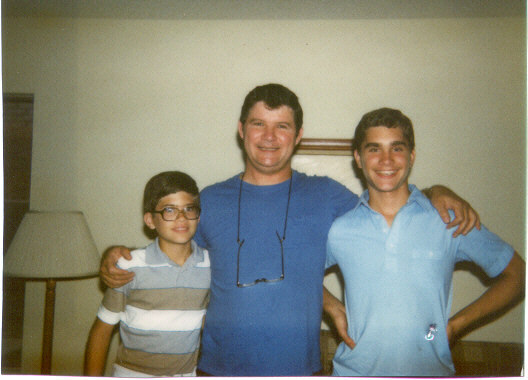 This is me my brother and my dad when i'm 14. I'm wearing black shirt and it might be shot the same day as the photo above of me and my grandma. That would make it summer of 1985 and I'd start high school that fall. click on smaller picture below to see full size one. 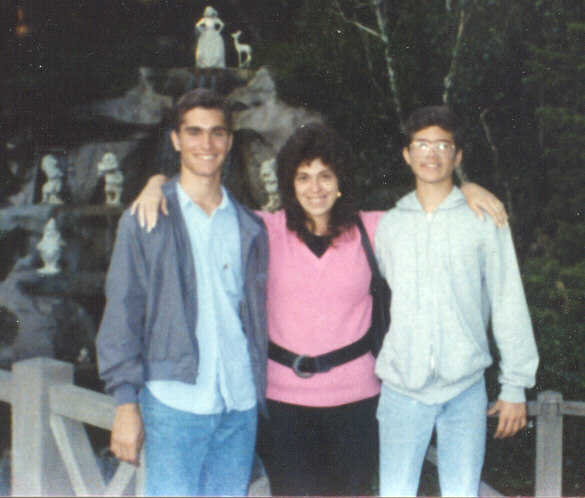 Click on the picture below to see me around age 15 at Disneyland or Knottsberry Farm with my older brother, Mark Adams, and aunt Tina(my mom's sister). I'm wearing the gray sweat jacket and the light blue jeans. I was going to Dana Hills High School. My first school in Dana Point was Marco Forster Junior High where I attended 8th grade before going to Dana Hills. 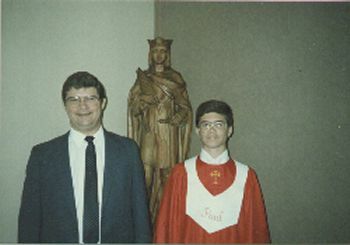 This is me again at age 15 its my confirmation picture. 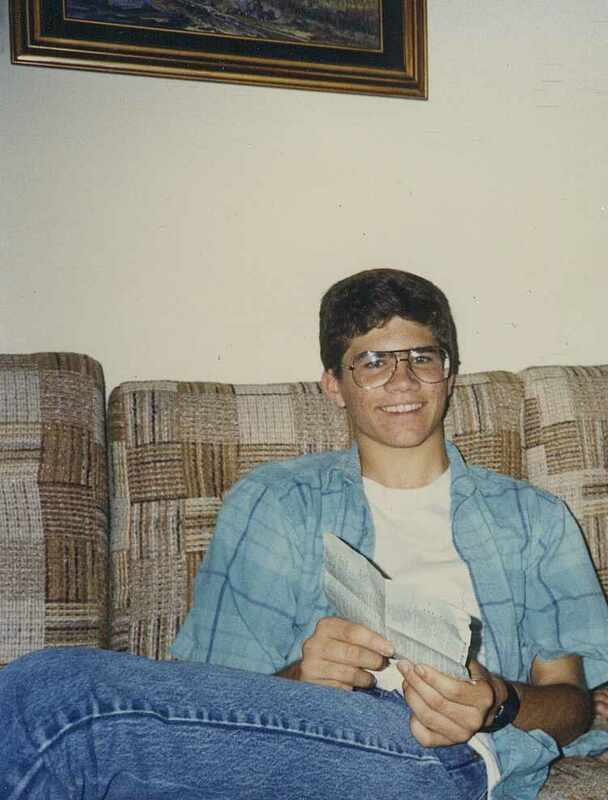 This was also from when I lived in Dana Point, CA and would be at the end of my freshmen year of high school or around May of 1986. 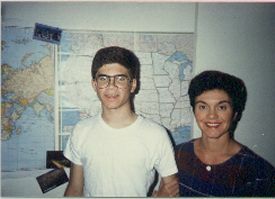 This is me at 17 with my mom in Foster City, California. 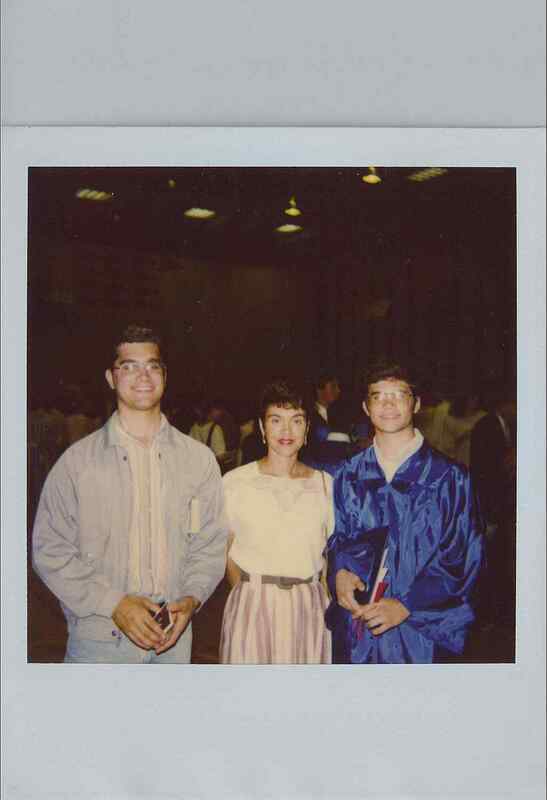 I was attending Hillsdale High School in San Mateo, CA where I graduated in 1989. 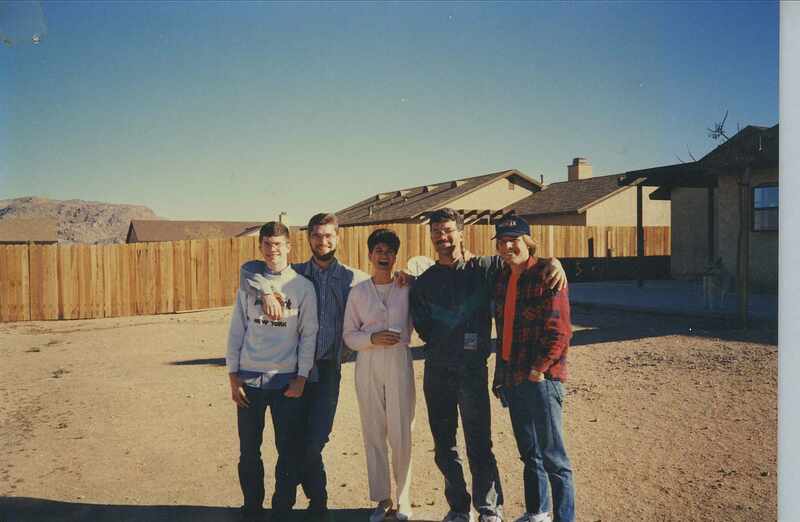 We moved to Foster City in the middle of my sophmore year of high school at the end of 1986 and lived at a Residence Inn for a few weeks before our home was ready, maybe 6-8 weeks, and celebrated my 16th birthday there. This didn't help my sophmore year grades much. The maps in the photo were something I hung on my wall my junior year of high school or the 87/88 school year. 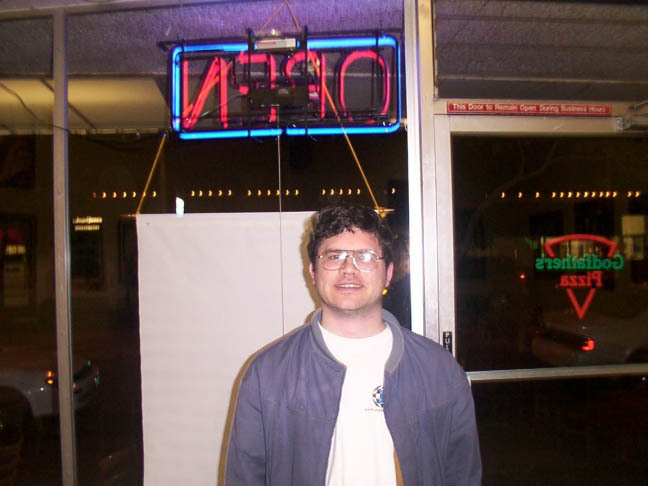 this is me around 16 or 17. I bought the Hard Rock Cafe New York shirt soon after turning 16 on a trip to visit my mom's family on Long Island, NY in spring of 1987. 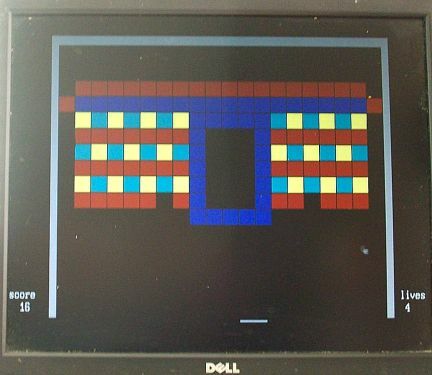 I got my first sensory chess board computer for my 17th birthday in December 1987 and I played some USCF(United States Chess Federation) chess events(mostly local quads I drove too) the summer after my junior year(1988) of high school after finding a copy of Chess Life at a Tower Books (a spin off of Tower Records) in San Mateo which listed local events. Chess would remain a life long interest. This is me and my brother in 1988. It's my brothers gradution from Hillsdale High School and i'm going on 17 and a half. 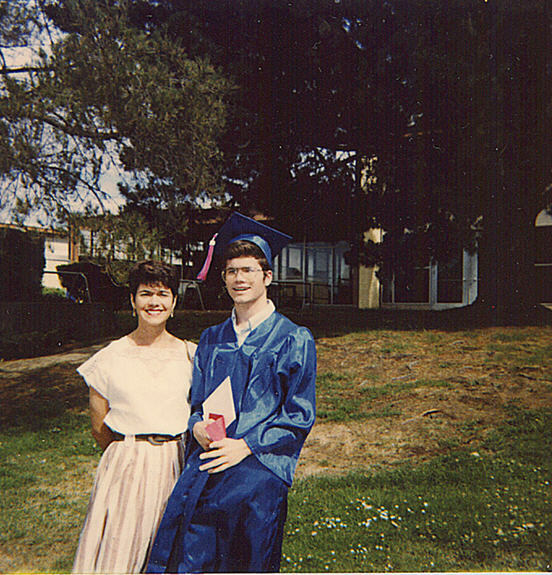 My brother after graduation went initially to San Mateo Community college where he got heavily involved in writing including for the school newspaper. He also got a Brother typewriter that had a 10 line display and then next a Mac Plus. I would get the Brother type writer when I started college and I bought the Mac Plus off him the summer after my first year of college when he upgraded. 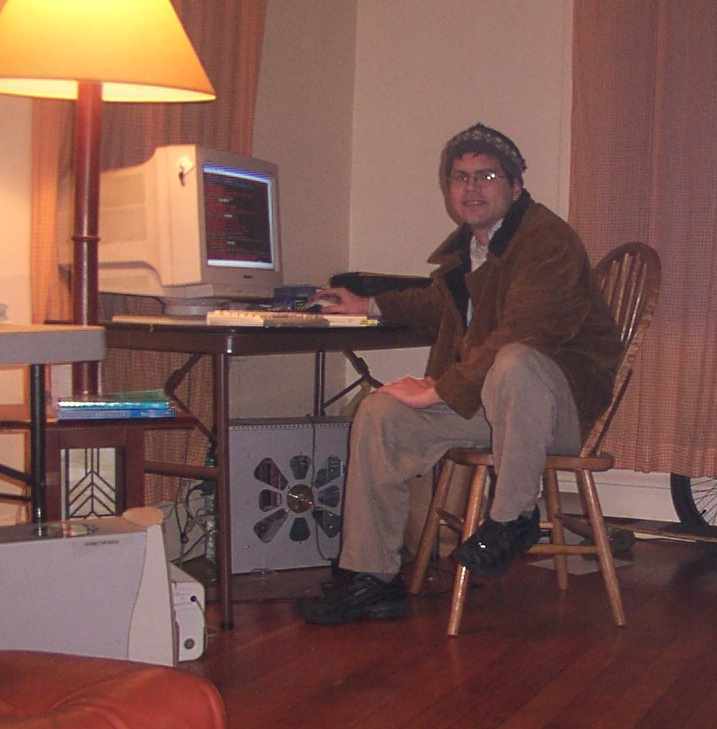 I was a hunter and pecker with typing and didn't learn to type till almost the end of college when I got my next computer, a Pentium 486SX-25 with Windows 3.1, and also bought a learn to type program which got me up to 25-30 wpm after a couple of months. 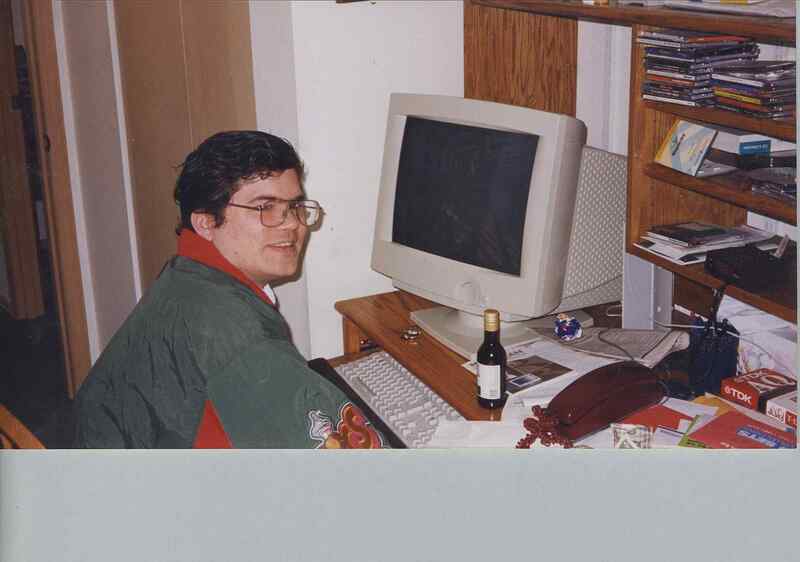 This was in preperation for taking a college course in programming fall of 93 which would be my last quarter at UCSC. It would also be my first programming course since taking BASIC all 3 years of junior high. This one is one of my high school graduation pictures i'm 18. It was taken at Hillsdale High School in San Mateo, CA. I graduated in 1989. I worked as a cashier at Longs Drug Store in Foster City my Junior and Senior year of high school and ran either track or cross country 9-12th grade. My grades were disrupted by my last move in the middle of high school but I managed to be accepted by UC Davis and UC Santa Cruz as a result of higher test scores and I chose Santa Cruz. this is another graudation picture taken of me in 1989. I am walking to pick up my diploma. And this is another graudation photo of me. 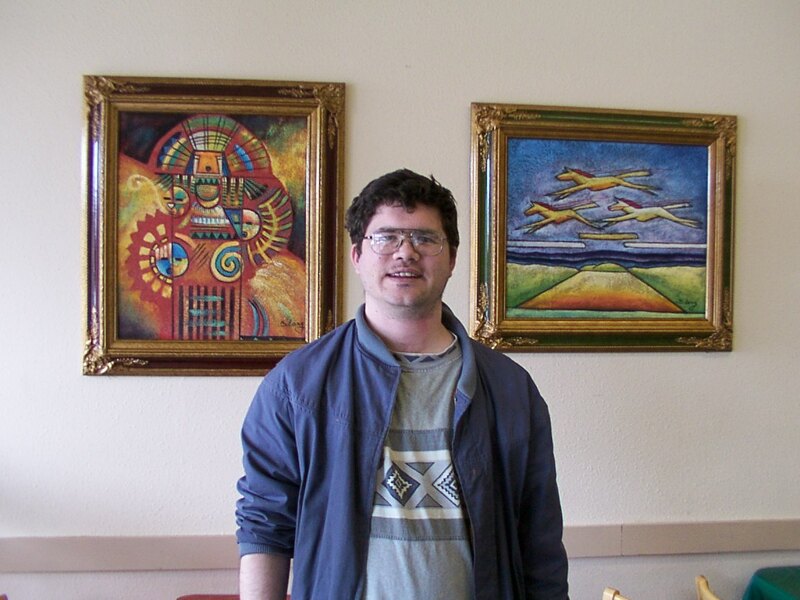 This next one has 2 pictures of me taken the summer of 89, when i was attending UCSC summer school(prior to starting as a freshperson in the fall) and living at the dorms for 5 weeks at Oaks college dormitory taking calculus and made freinds with a lot of Jappanese who were there learning english. So these two are group shots and i'm the white guy. This is me around 88-89 in probably Foster City. I'm the slightly smaller figure and the other guy is my brother Mark Adams. 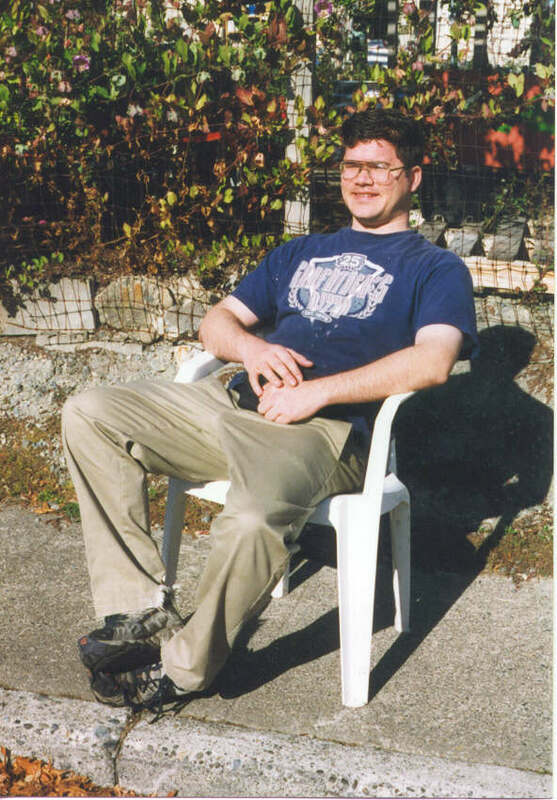 This picture is of me in my first year of college at the University of California at Santa Cruz ( UCSC ) probably age 19, in 1990. 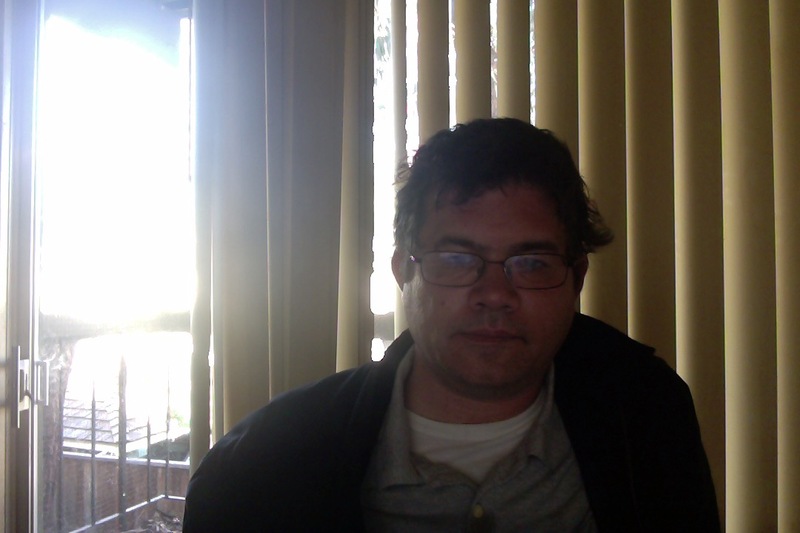 I graduated from UCSC in 1993 as a history major from Stevenson College. Colleges at Santa Cruz were primarily residential and I lived in dorms 2, 6, and 8 and took three quarters(they now do two) of the Stevenson Core Course. Stevenson Core is a survey of western and non western cultures from ancient to modern times with a great book covered each week which we would read in full or part. The focus was analyzing the realtionship between self and society. Some of the books were Plato's Republic, the Tao Te Ching, The Prince, and in the final quarter modern writers like Freud and Sartre. After my first year of college I visited Europe for 4 weeks summer of 1990 using money earned working in high school. In my junior year I wrote for an intellectual history course an essay on Kafka that I saved that analyzed In the Penal Colony My senior year at UCSC was spent taking math, one science course(physics), and in the last quarter a c programming course with my free electives once done with my major starting with resuming calculus. 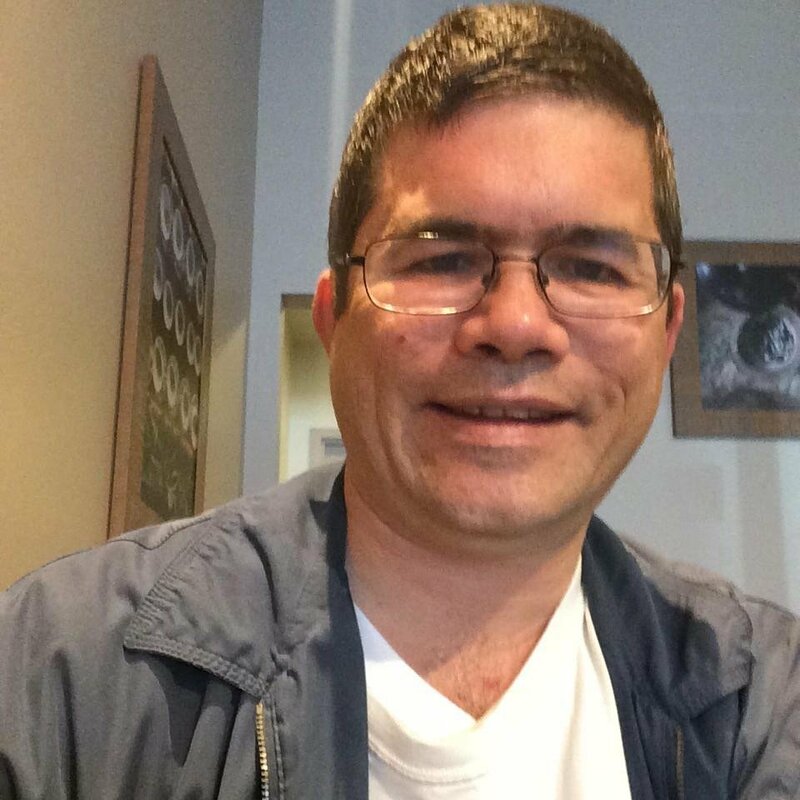 I would do one semester at San Jose State University in spring of 1994 after graduating in December 1993, with the idea at the time of doing a second degree in math or programming. 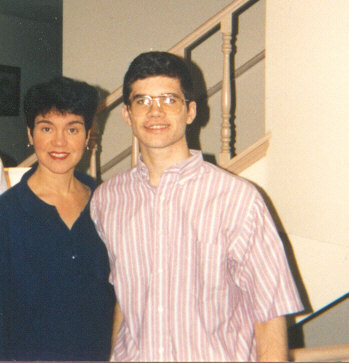 This is me with my brother in probably 1990(but possibly Christmas 89) when i was 19. My brother has the beard. This appears to be a group shot from the same day/gathering. I have on my Hard Rock Cafe New York shirt again. 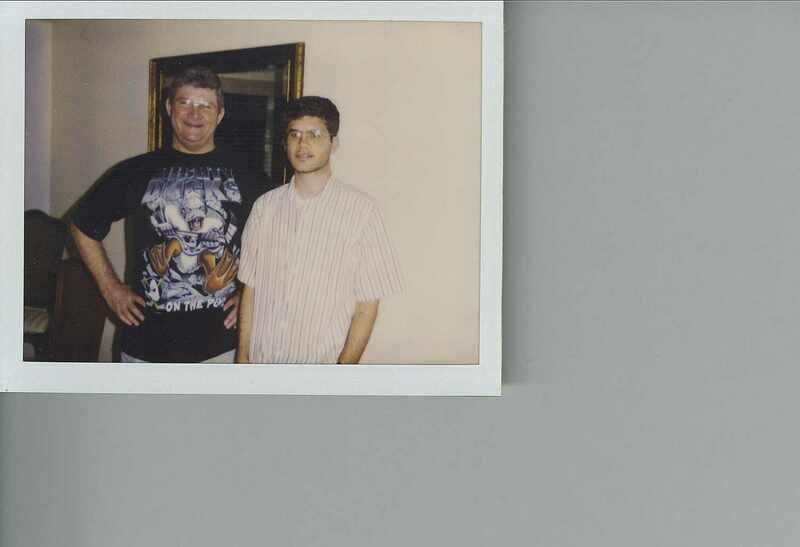 Below is of me about age 21. click to see full size one, and this is probably around that period, me and my dad. 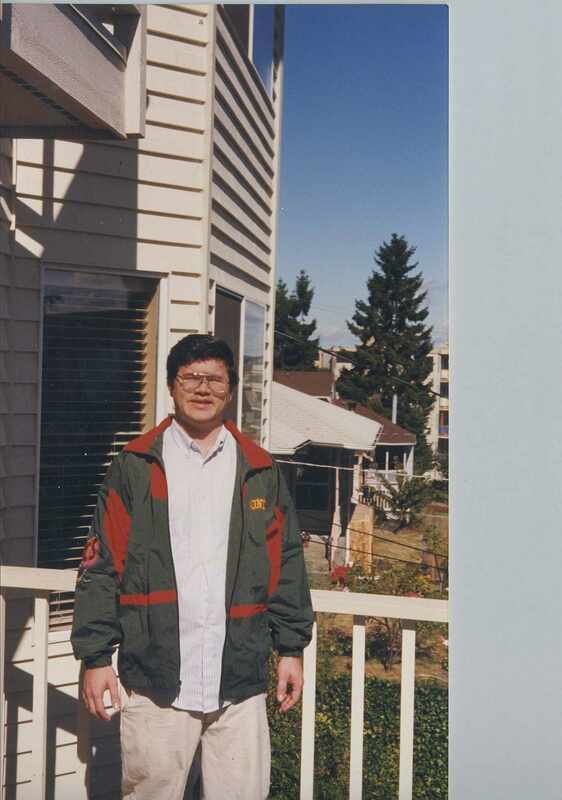 This is another one of me in Seattle in 1999 and this is another from probably the same day. I'm out on the deck and it looks like spring. That would make it about a year after I first got internet in early 1998. 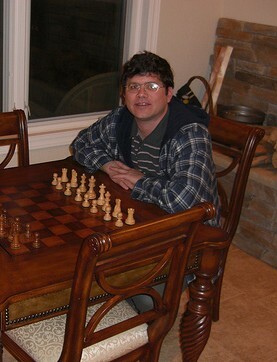 These photo's were shot to pick one out to post as my picture on ICC(Internet chess club or chessclub.com). They were developed at Seattle Film Works, an outfit that the place I was working for at the time, Godfathers Pizza Magnolia, delivered pizza too. Photo processing with them consisted of both actual prints and a CD with digital copies. 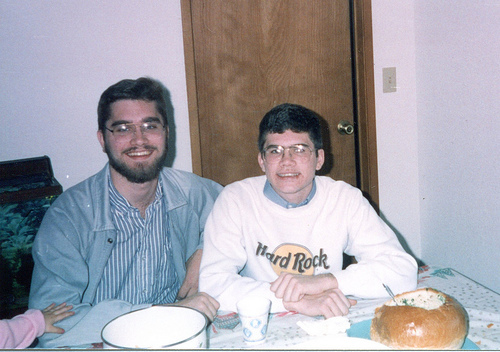 This is me in Seattle in the spring of 2001. the person to my right is Dave a former co-worker and friend. Click below for full size. 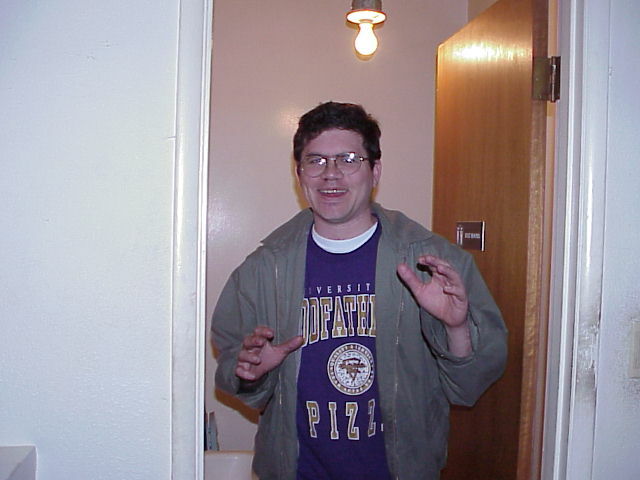 This is another one of me from spring 2001. Click on the picture for the full sized image. Here are four from 2001 probably spring. 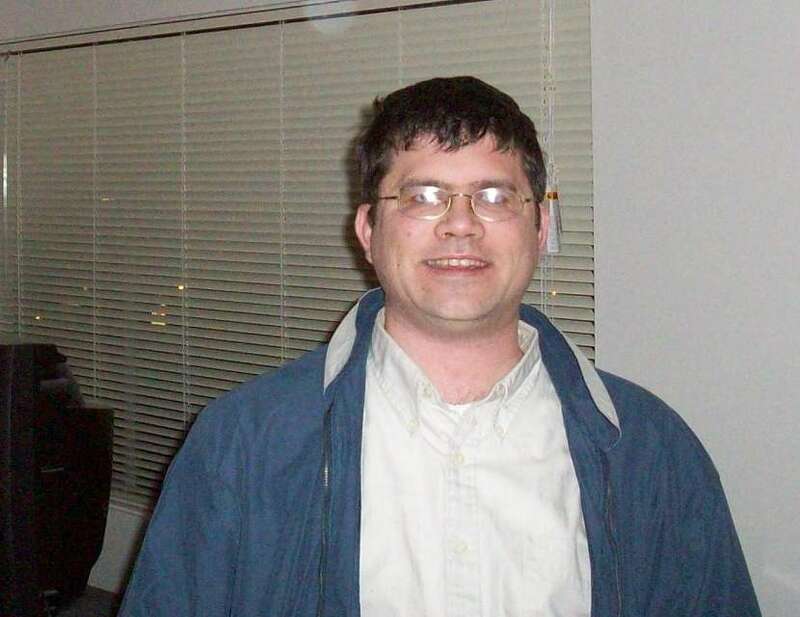 While I had written by 2001 my Pulsar chess engine, I hadn't quite transitioned to the idea of being a programmer and was at this time at City University studying accounting. In the spring I purchased my first digital camera, a Kodak, for around 200 dollars which I used to shoot most of the pictures seen here over the next few years. 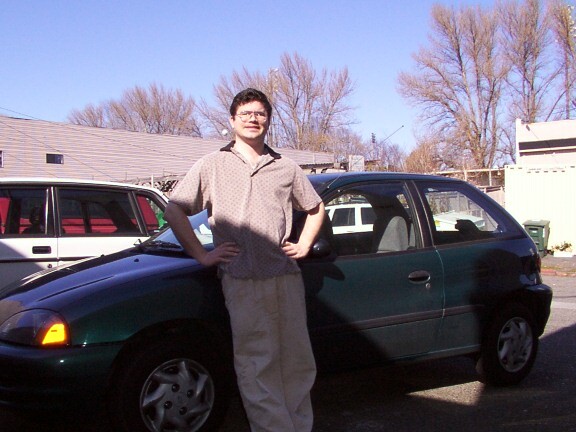 This one is me posing in front of my chevy metro the car I used to deliver pizza at the time for Godfathers. 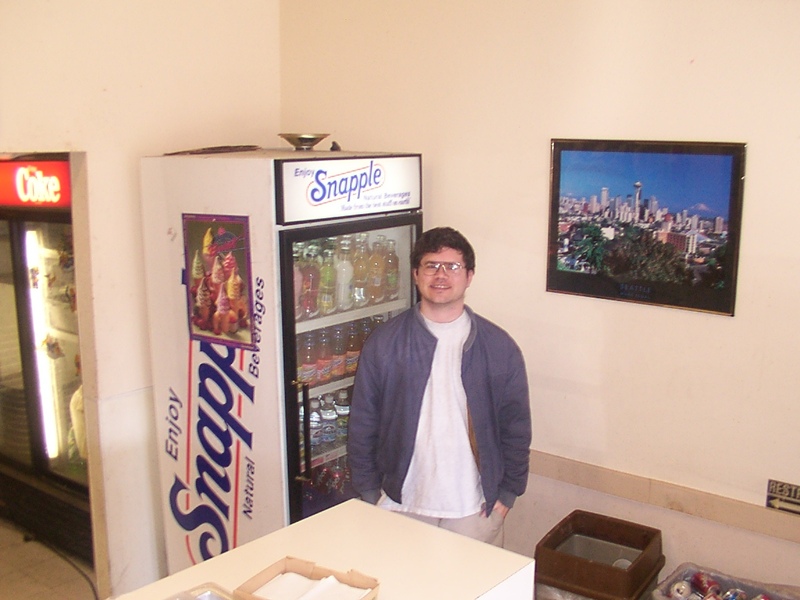 And this is me in front of the Snapple cooler and this is me in the front eating area of Godfathers Magnolia as well as this where we had hanged some art. 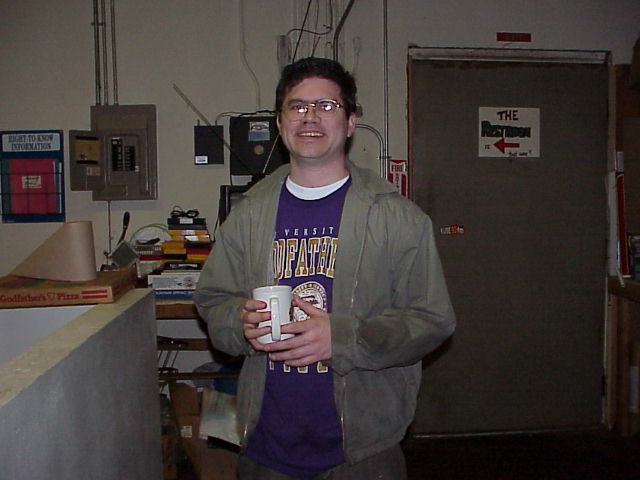 This is me drinking coffee at work in 2002 at Godfathers Pizza. This one also appears to be from the same period and I have no idea what i'm doing. 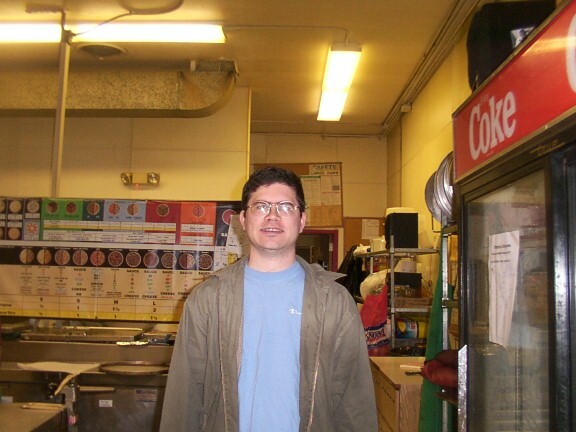 Another of me at work on March 12, 2002. And this might be another shot with me holding the same cup of coffee in a different pose as the first 2002 photo. 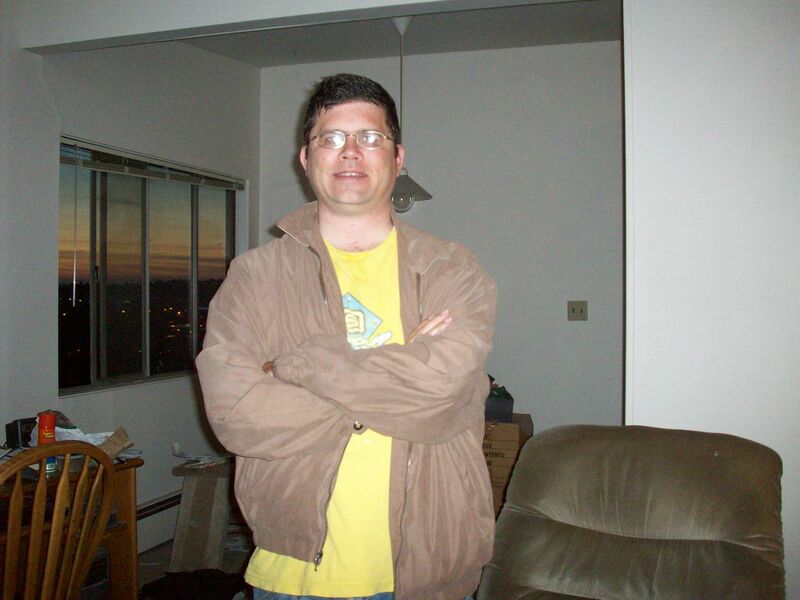 This is me in November 11, 2003 taken in Seattle as well. 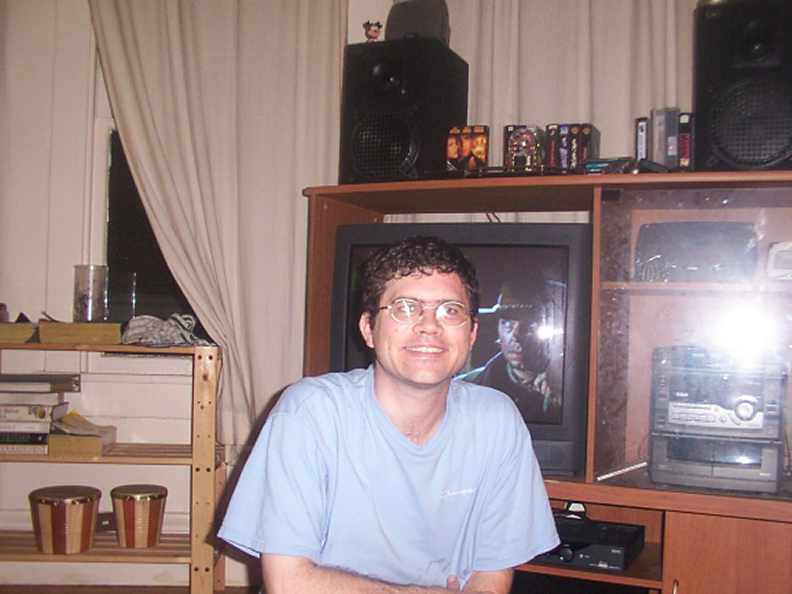 This is me in 2003 at my rented unit in a duplex in Queen Anne Seattle I shared with my housemate Mathew. Im in front of my Samsung TV Around the same time I did this one in front of the fish tank And this is same place, the duplex in 2003 with me on our old couch. 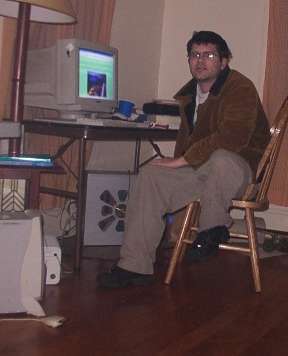 This is me in 2003 as well except i'm in my Pagliacci work sweat shirt. 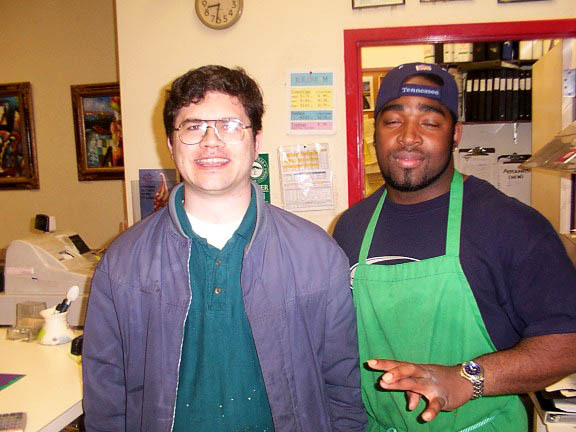 I started working for Pagliacci Pizza as a driver in April of 2003 and was attending City University taking programming courses and was 32 that year. Programming was a passion outside of school as well and I wrote a celebrated bot on ICC, LibraryBot, also in 2003. 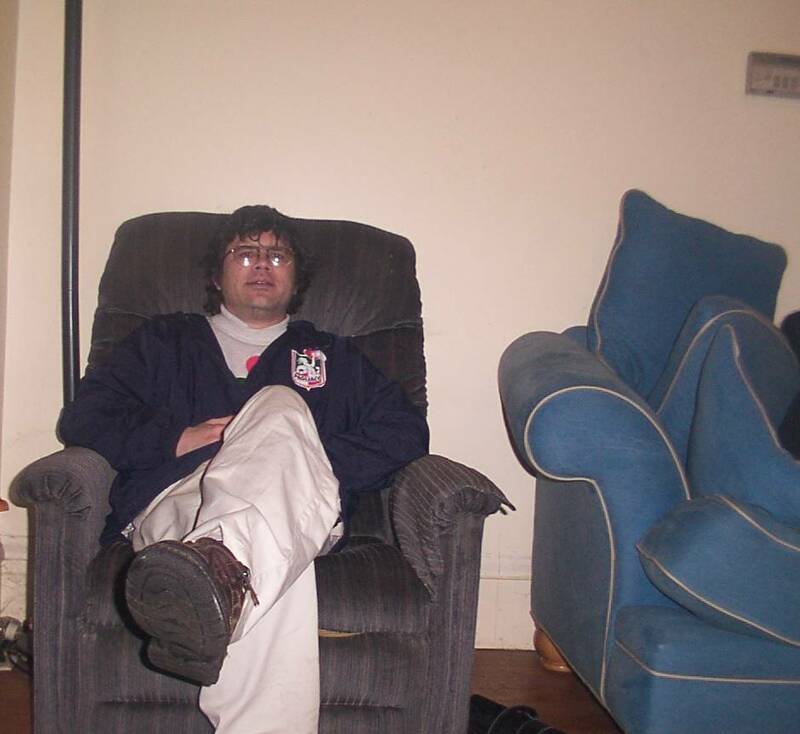 This is me in December 2004 at the duplex I shared with Matt in Seattle and this is my brother visiting me at that duplex at Christmas 2004. I was continuing learning C++ that year and was taught MFC as well which let me do my first graphical non console Windows programs and wrote two plugins for the ICC's interface Blitzin then. 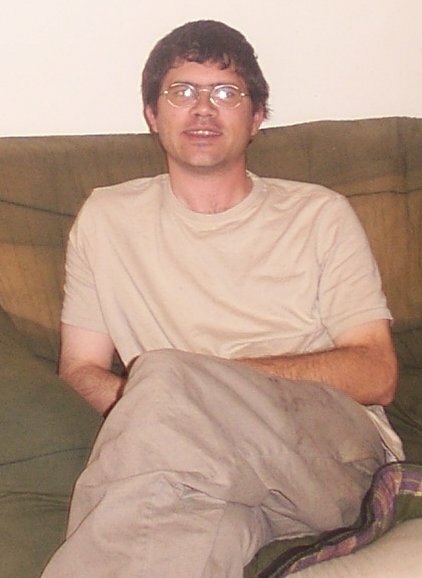 This is me at christmas 2005 at my parents place in Dayton, NV. This was my first Christmas in Dayton and my parents had moved there to retire that year. I'm on the right. 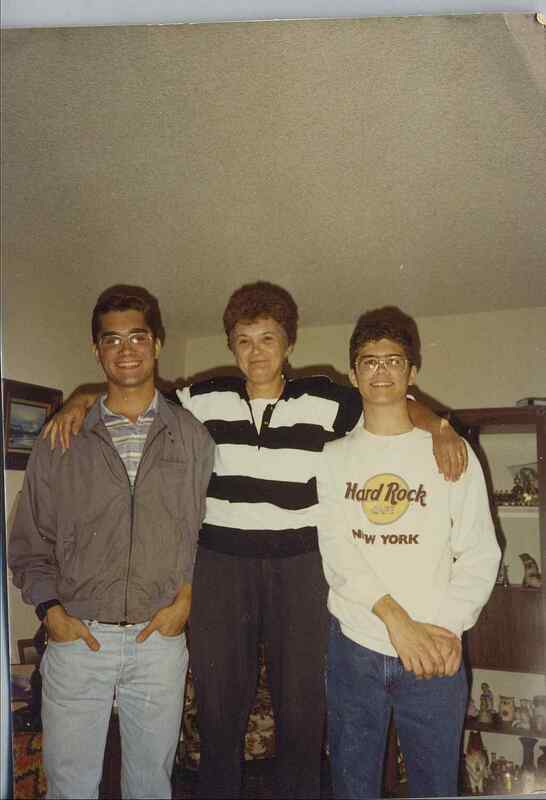 My mom is in the middle (Linda Adams) and my brother Mark is on the left. Photo got a little damaged but the right side looks ok. 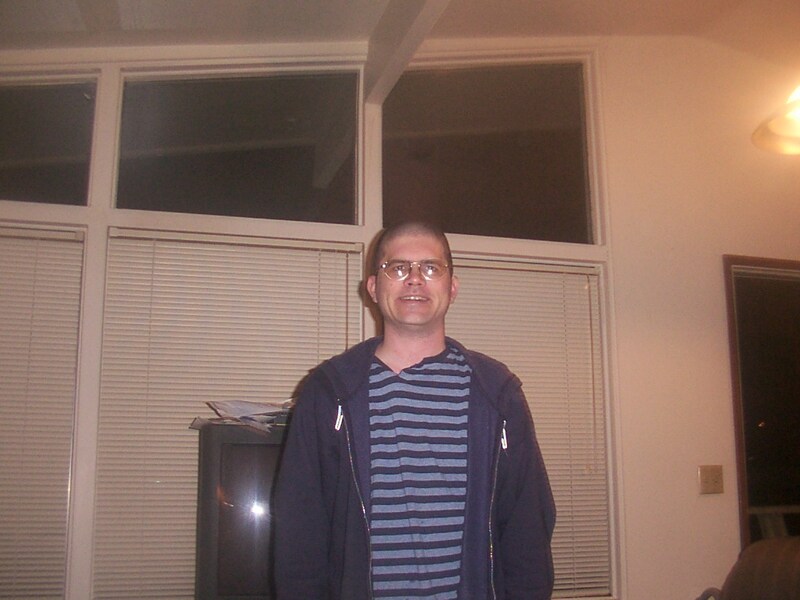 This is me April 18th 2006 after a haircut my friend Ryan gave me. It was cut shorter than I expected. 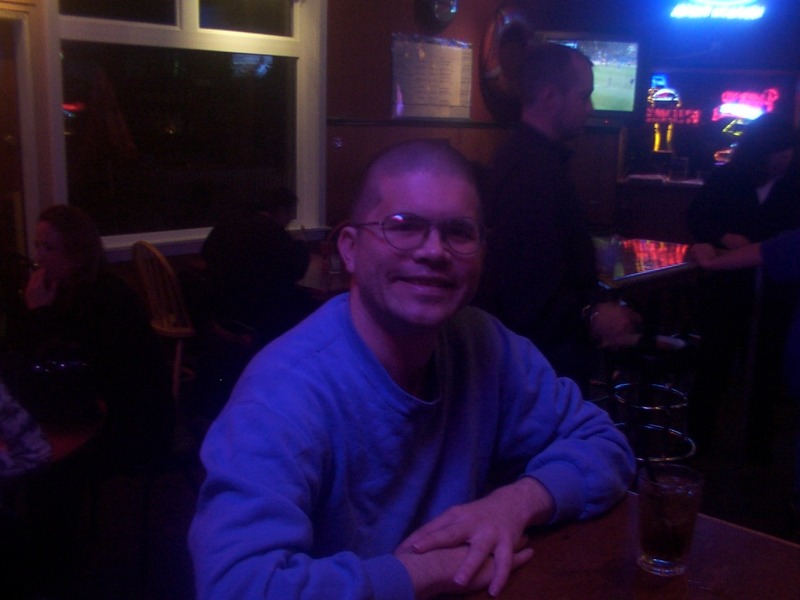 The next day, April 19, someone took a photo of me at the Boxcar in Seattle. 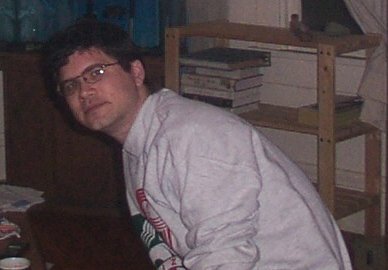 And this is me, Mike Adams, May 2, 2006 though i'm not sure where it's taken though it looks like its at a friends apartment in Seattle. My hair is starting to grow in again. 2006 was the last year i was in school at City University, finishing at the end of the year, and getting a full time job programming toward the end of 2007. July 19, 2008 in my apartment in Seattle, and this is September 22 2008 after work. 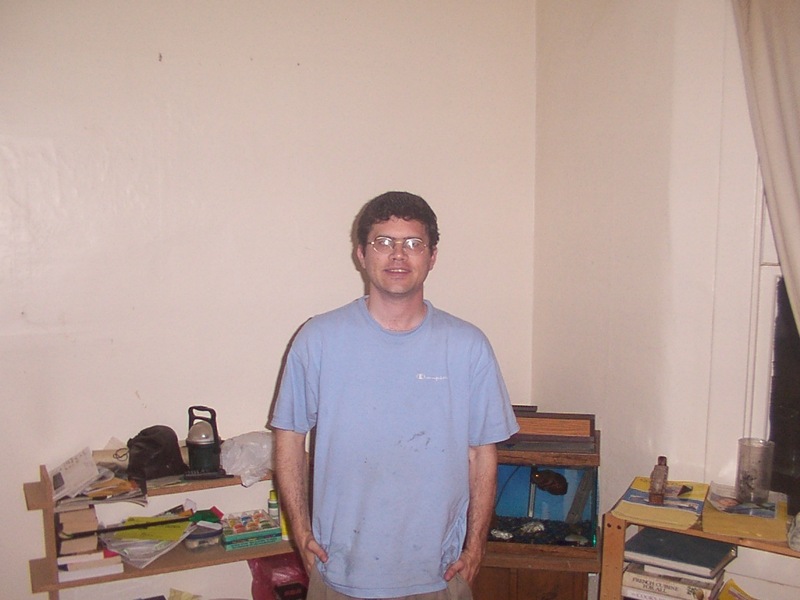 I started my first desk job as a programmer on November 13, 2007. I had given two weeks notice at Pagliacci and went from delivering pizza one night to starting as a programmer 9 am the next morning. I was running to Fred Meyers after work(I had some earlier shifts at the end) which was open till 11pm to pick up my dress shirts and pants I needed for my new job. 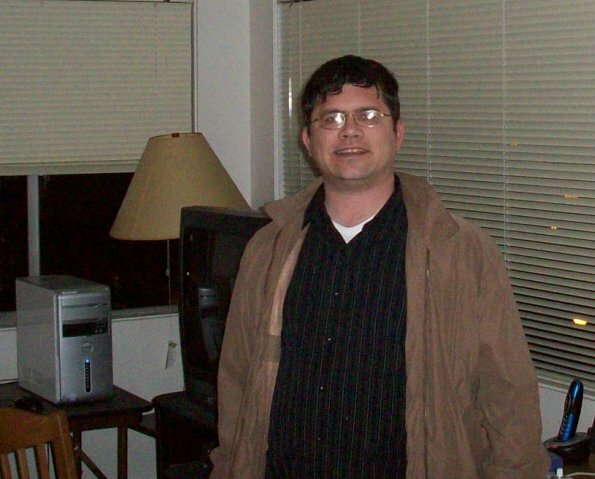 This is December 27th 2008 at home in my apartment in Queen Anne, Seattle. It's an hour before my 38th birthday. Also features my cat at the time, Smokey. 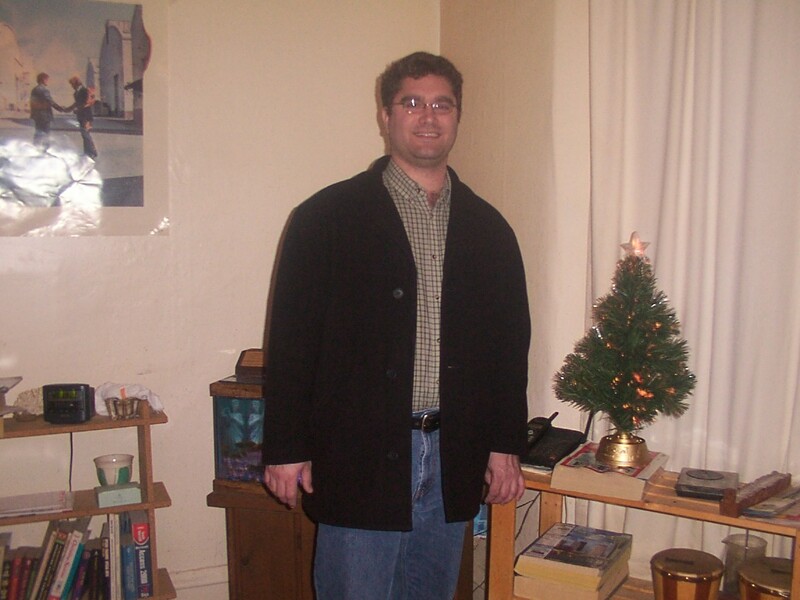 Here I am a few days later on 12-31-08. 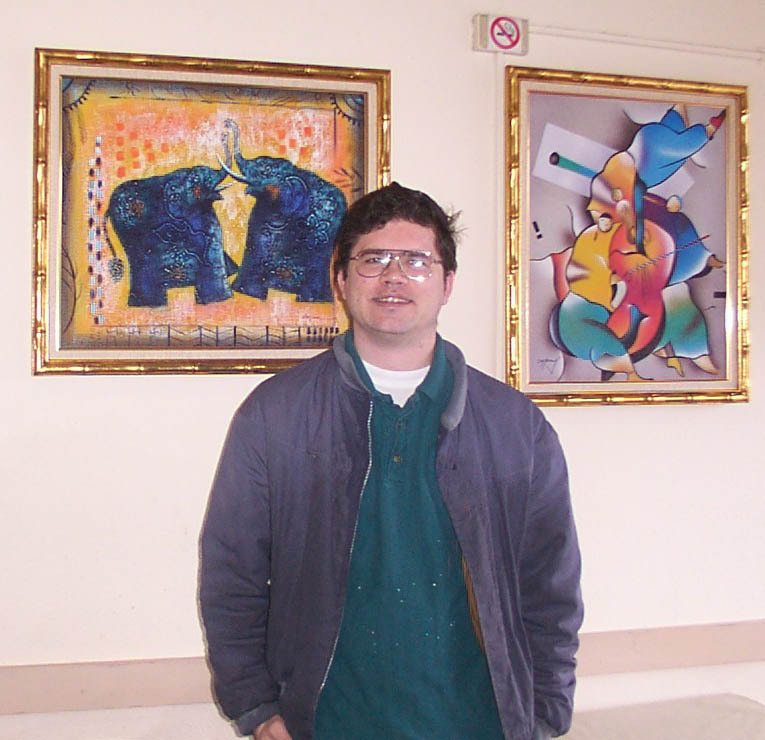 This is March 12th 2009 And this is me April 21, 2009 I started picking up weight in 2008 after getting my first deskjob(Nov 2007) which i've since lost. 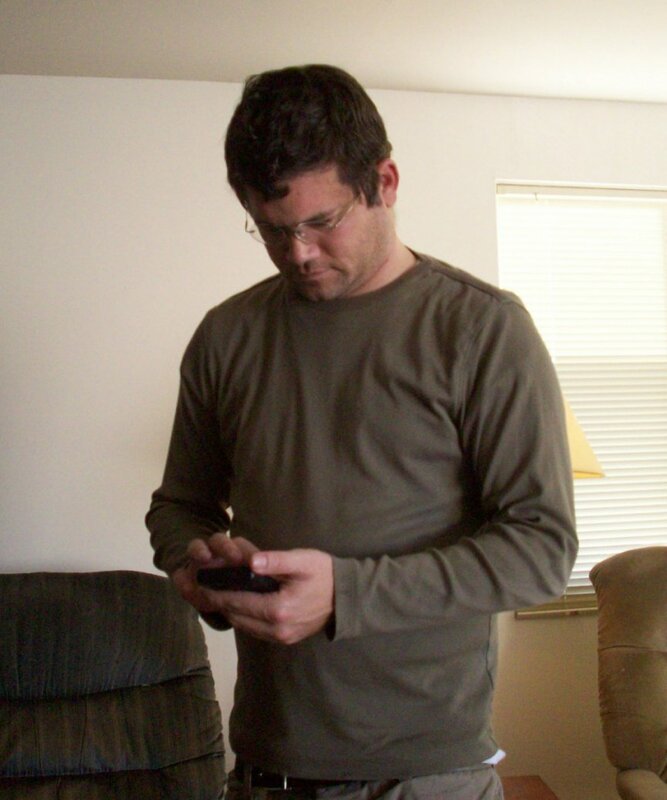 This is November, 28 2010 I'm holding my droidX phone, something I was programming for. This was the year I started the Lantern Chess interface for ICC to better teach myself Java. I had had two courses in Java in 2005 and had used it for smaller sized programs off and on over the years. 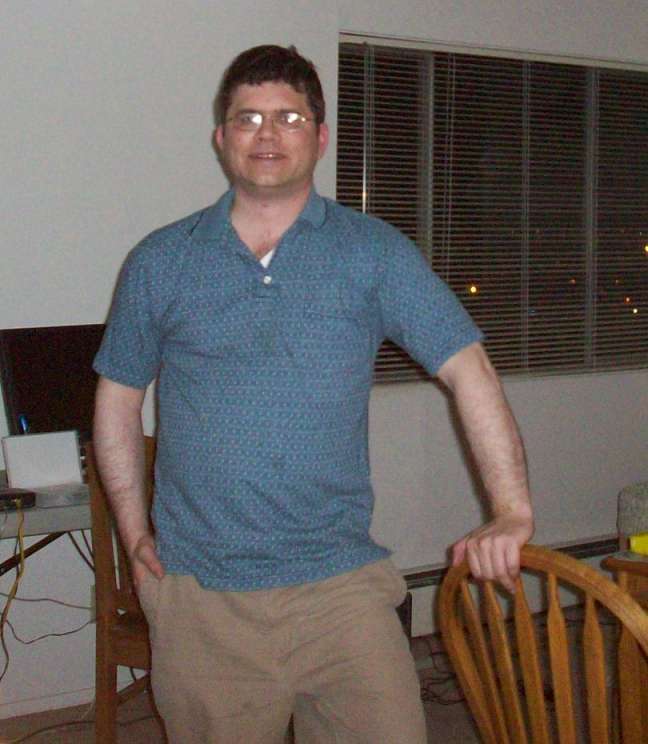 This was also a period I was active on DaniWeb.com as adams161 asking and answering Java programming questions. I drifted away from photography in 2011 and 2012, having gotten into shooting videos instead. 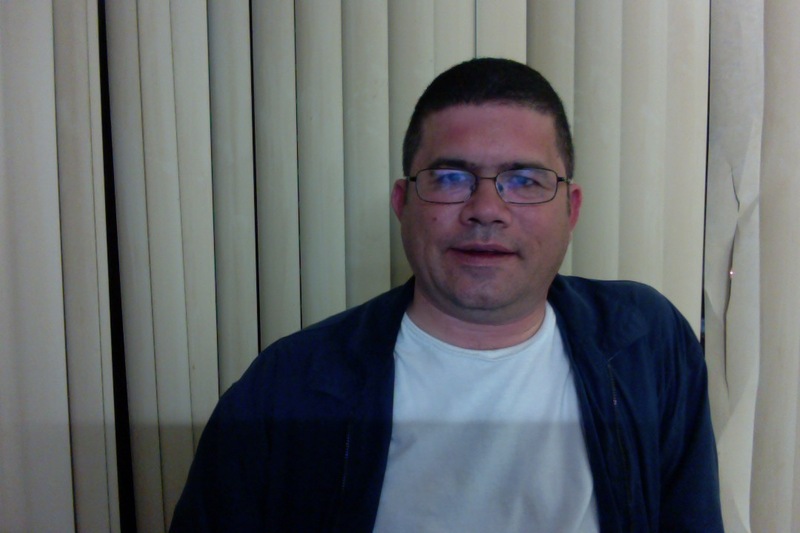 My YouTube channel can be seen at adams161. In June of 2012 with a shaky start I began learning iOS programming for iPhone and iPad with the intent of making a Lantern on iOS interface to ICC. Much of the first year's learning process can be seen in my questions to stackoverflow on my lantermike account. I've also at this point started answering more questions than i've asked mostly in Java. This is me on June 14th, 2013. I'm on a 4 day vacation from work and this is shot with my iPad. The iPad and iPod cameras have re-kindled an interest in photography. In late September 2013 and early October 2013 I had the chance to visit California on a vacation and shot the following pictures: San Jose at Little Saigon, Santa Clara University, Santa Cruz 10-1-2013, and Santa Cruz 10-4-2013. In Fall of 2014 I moved to Bay area California, first Sunnyvale and then a little further north and have 3 pictures to share from my Sunnyvale period. At this time i work in the Bay Area, CA as a mobile developer. I've also during this period and a little before been posting various things on my twitter account PulsarMike. Anyone who remembers me still or attended school with me at any of the many schools I went to, Washington Elementary School in Santa Clara (1975-1976), Liberty Town Elementary School in Maryland (1977-1981), Sunset Elementary School in San Diego(Poway school district) (1981-1982), Black Mountain Middle School also San Diego (1982-1984), Marco Forster Junior High in Dana Point, CA (1984-1985), Dana Hills High School in Dana Point, CA (1985-1986), Hillsdale High School in San Mateo, CA (1987-1989), UCSC University of California at Santa Cruz, Stevenson College (1989-1993), San Jose State University (Spring 1994), North Seattle Community College (fall of 96 then again in 1999/00) or City University, WA (Fall 2000 - Sept 2006) feel free to drop me a line at lanternbugs at gmail.